The California School Boards Association (CSBA) does not oppose later school start times; CSBA opposes a mandate on school start times. Individual school boards should be able to explore whether later start times make sense for their communities, but this approach should not be required. 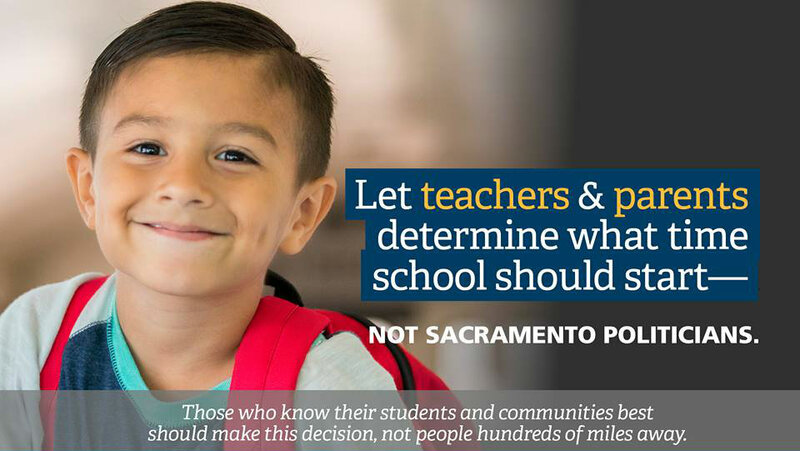 Local students, parents and teachers understand their needs better than Sacramento legislators and have the most stake in doing what’s right for children and families. Unfortunately, Senate Bill 328 takes a cookie-cutter approach by mandating start times of 8:30 a.m. or later for middle and high schools throughout the state — no matter the needs of the local community. This radio ad sponsored by CSBA highlights some of the real-life consequences of a mandated later school start time, including hardship for working parents without flexible schedules, the lack of before-school care available and the domino effect of a later start time on extracurriculars, sports practice and after-school jobs.